This issue was a bit of a challenge to read. 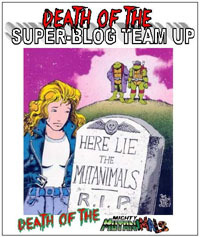 In it, much as I hold very fond memories of the Ultraverse, this really drives home the notion that my fond memories precede the Black September event, that they come from the "original" Ultraverse, before it "rebooted" into a "Marvel-Lite" imprint sorta thing. And just looking at the credits, if only from a 2018 standpoint, this reeks of non-priority to the publisher. 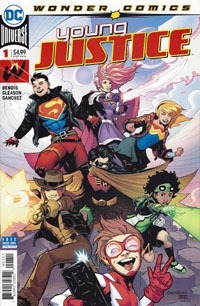 I recognize several names that SHOULD have meant this was an excellent issue–especially seeing Dan Abnett‘s name as a writer. But when you have two writers, four different pencillers and 4 different inkers, two different letterers, two different colorists…this screams "piecemeal" and generic incoherence. We get "big" story beats in stuff like Rex Mundi’s "Alternate"–somehow because he–in this universe–did such a perfect job of cloning himself, the Phoenix–brought into this universe from another–subdivides itself to match. We "see" Mantra, and get a moment of her seeing/thinking she’s been "warned" about Topaz, but why does she get the look she does? But there’s zero explanation as to who/what she is, or the relationship…and if nothing’s going to be expounded on, why include it to begin with? Probably another problem with this comes with reading it now in 2018, after 15+ years of being conditioned to 6-issue (minimum, mostly) story-arcs and year-long mega-crossover-events and the like. 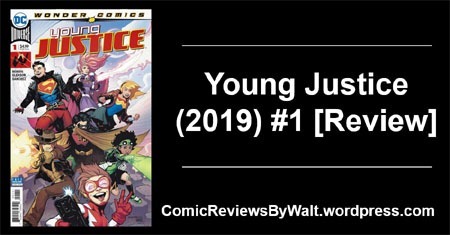 As something spanning two teams from two universes, plus so many ancillary characters from one, with a huge, cosmic, universe-threatening entity…it just seems impossible for anything to be done justice. Something like this really WOULD be fairly justified to have AT LEAST one full issue apiece for each of the Ultraverse titles, a couple "main" issues for everyone, and even an X-Men tie-in or few. 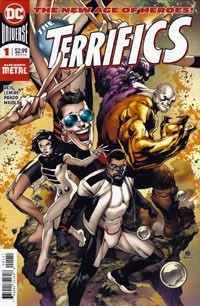 Not full 3-4-6-issue arcs per title, but at least a few more full-length issues. Everything crammed into just a couple issues after just a couple pages per title…it’s rushed, and sloppy, and overall just generic and mostly incoherent. 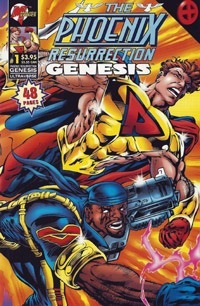 As I’ve read these, I’ve become all the more convinced that the beauty and depth and such of the Ultraverse–the "heart" of the Ultraverse–is definitely in its first couple years, its run of titles when they were actually their own thing, before being wholly given over to Marvel and all that. 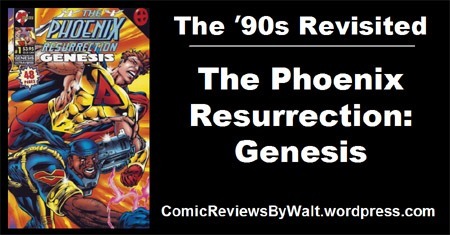 The cover-art, and the CONCEPT is sound; and the idea of some crossover between the X-Men and most of the Ultraverse, and their facing the Phoenix Force, and it having counterpart/ties within the Ultraverse isn’t all that bad. But this execution of it all is not much to my liking, and really feels like the sort of thing I’d say one is better off passing on. Of course, if you find it in a 25-cent bin–the whole ‘event’, anyway–it might be worth $1 or so to get all four issues; but I’d encourage one to seek out older Ultraverse stuff if you’re just interested in "trying" an Ultraverse title. I remember the Black September ‘event’ back in 1995. 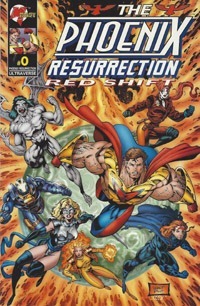 Perhaps for its timing–Black September, this new era for the Ultraverse, this reboot/relaunch/renumbering–coincided with my entering high school, so for me my own life was starting a brand new direction and all that. I also remember stuff about this particular trail through the Ultraverse titles post-Godwheel heading into the event, though I missed out on the Ultraforce/Avengers issues, and so dropped in "cold" on the black-cover "Infinity" issues that September (with #1s in October). 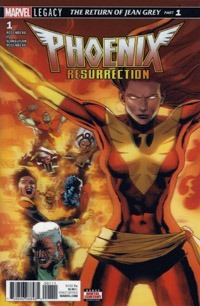 At the #2s in November, each book had a 3-page "flip book" chapter of this Phoenix Resurrection thing, in much the way Rune had premiered a couple years earlier. 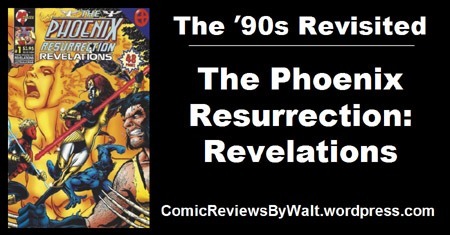 Then there were the larger issues Phoenix Resurrection: Genesis and Revelations, and Aftermath…and they led into some other title, Foxfire. But I don’t recall if I ever got around to actually reading them all, or particularly caring about them all–this was late 1995, and rapidly heading toward one of my "off periods" with comics where I barely kept up with anything for about a year. So reading this now is like reading a whole new thing for me–I was aware of its existence, but have no conscious memory of actually reading the thing. And this Red Shift issue is something I don’t recall being aware of at the time in 1995–I discovered it some years after. Red Shift is actually a collected edition of sorts: it collects the seven 3-page segments, making up a 21-page single-issue comic. 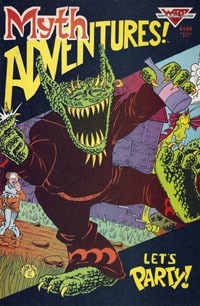 The indicia shows it to be an American Entertainment edition–and its lack of cover price indicates this to be a special issue that would have been available through the mail-order comics company. This issue turns a ten-comic "event" into a 4-issue thing…making for a line-wide event of only 4 issues…something virtually unheard of in present-day, particularly from Marvel! 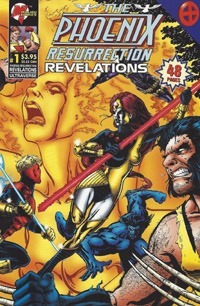 Marvel had bought Malibu by this point, and though the Malibu Comics logo remained on the covers, there were a number of Marvel characters that had crossed over into the Ultraverse, perhaps most notably Avengers character Black Knight, and X-Men villain Juggernaut. There were a number of other specific-story crossovers, where characters would cross for the story but not as a status quo. Red Shift feels like what it is, as a collection of 3-page snippets, with numerous visual styles, and nowhere near enough room for any true story to develop, as they’re basically short little vignettes contextualizing each title’s "recent" prior experience heading into the main event story. Had I bought all seven issues specifically for the flip-book/backup, I’d have been sorely disappointed. Though I know the characters from my own prior experience reading Ultraverse stuff, as a standalone issue, this felt like a real mess trying to read it, and I really had to rely on memory of status quo from 22 years ago to have any slight idea what was going on. The differing art styles seem–especially looking back–to be absolutely very "’90s" in style…with some generic and gratuitous posing, quasi- or wannabe "iconic" images, and so on…nothing overly dynamic or bad, exactly, but nothing great, either. Most of the creative team are names I don’t recognize (though I recognize several, as this would be early work by them before going to higher profile stuff). 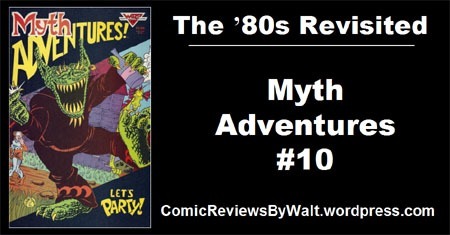 That leaves things to the characters, who are mostly recognizable, albeit as their relaunched looks, which were less distinctive and striking than their 1993/1994 debut appearances. Story-wise, again, these were way too short and disjointed to really have any significance or development. 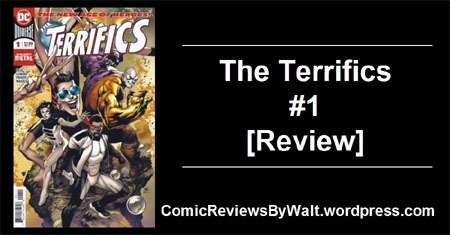 Had they been simply 3 pages apiece within a main issue, worked into 3-page-longer-than-usual issues, they might have had more significance, serving as a universe-wide subplot, rather than being isolated out of whatever story was beginning in the respective titles. All in all, I’m far from impressed by this issue, outside of the novelty of having these disparate segments brought together in a single issue like Rune #0. The art isn’t horrible but isn’t anything wonderful, and the story doesn’t do anything for me and doesn’t really do anything for the characters except provide a slight reference point. 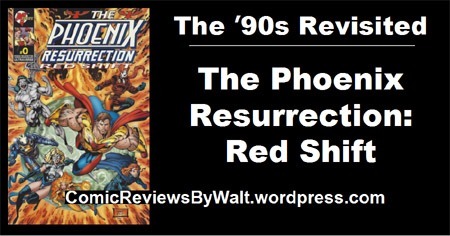 If you’re not already into these characters, I’d avoid this issue; there’s almost certainly more to be had in the "main" Phoenix Resurrection issues.